in December 2015, Akretion announced an Odoo module to import regular PDF invoices. in 2016, Akretion made three announcements (one, two and three) concerning the import and export of electronic invoices. With these developments, encoding supplier invoices became faster and more convenient. But there was still one big painful and time-consuming task for the accountant i.e. the processing of the expenses paid by card, travel expenses in particular. If some employees within your company travel a lot, you get a high volume of expenses paid by card - train tickets, parking fees, toll expenses, taxi bills, customer invitations… Getting the expense tickets back from the employees, encoding them one-by-one in the accounting software and archiving them is such a time-consuming task! So, today, Akretion is proud to announce that managing expenses will no longer be the most painful task in accounting! Wake-up, the nightmare is over: the Odoo-Mooncard connector is here! an easy and fast recording of that expense from your smartphone. Mooncard has been launched in France in October 2016; it will be extended to other countries in the future. a receipt, to have a proof of the expense for the fiscal administration. reconcile both the expense and the payment. Mooncard instantly receives the raw bank transaction, which contains all the details about the payment (date, time, amount in local currency, amount in EUR) and also the details about the vendor (vendor name, country, activity, etc.). Among the 6 pieces of information needed to record the transaction in the books: - the date is known, - the total amount is known, - the kind of expense can be guessed from the activity of the vendor, - the VAT amount can be guessed from the kind of expense and the country of the vendor. The user is instantly notified of the payment on his/her smartphone. With his/her smartphone, he/she can: - modify the kind of expense if needed, - modify the VAT amount if needed, - write a description of the expense. If the user has granted Mooncard access to his calendar, he/she can select any entry in his/her calendar and have it copied as the description of the expense (e.g. Lunch with Mr Baker) - take a picture of the receipt with the camera of his/her smartphone. Once the user has validated the information on his/her smartphone, that information is sent to Mooncard. The accountant can import the transaction from Mooncard to the accounting software. Thanks to the Odoo-Mooncard connector, it is pretty easy! Competing enterprise expense management solutions also take advantage of the smartphone of the employee to take a picture of the receipt and then use OCR (Optical Character Recognition) to try to extract the relevant information. But real-life experiences show that OCR regularly fails to extract all the required information. The solution offered by Mooncard, thanks to the use of a dedicated corporate card, is much better than any other competing OCR-based solution. 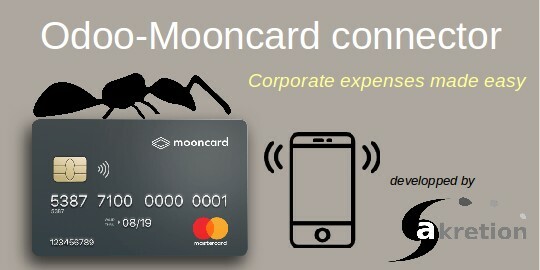 The Odoo-Mooncard connector has been developed by Akretion and is available on a dedicated Github project under the AGPL licence. Upon the installation of the Odoo modules for Mooncard, one product is created for each kind of expense as per the Mooncard expense nomenclature (which has about 30 expense categories). Then, on each Odoo product, the accountant can configure the appropriate expense account and an optional VAT tax. 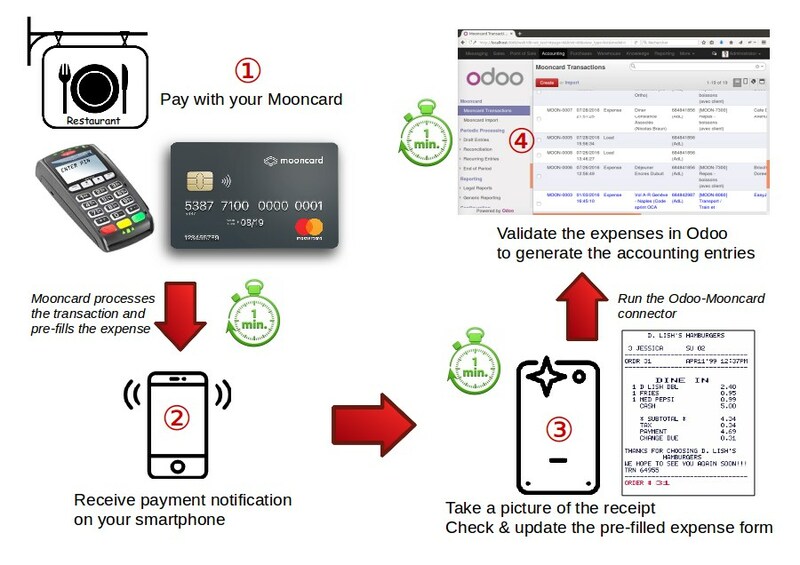 The Mooncard connector will download the card transactions into Odoo; each transaction will be matched with the corresponding Odoo product. check the properties of each Mooncard transaction by comparing them with the image of the receipt. The accountant can modify the description of the expense, the VAT amount, the expense category and the expense account if needed. validate the transactions in one click only! For each transaction, Odoo will create a supplier invoice, attach the image of the receipt to that invoice and record the corresponding payment. Akretion offers its services to help you deploy the Odoo-Mooncard connector within your company and adjust the connector to your requirements if necessary.